Why not? Didn’t you want to see the first annual Big 10 Championship game? …I actually like the Badgers when they aren’t playing TCU in the Rose Bowl. …a local kid is a team captain. Good guy. 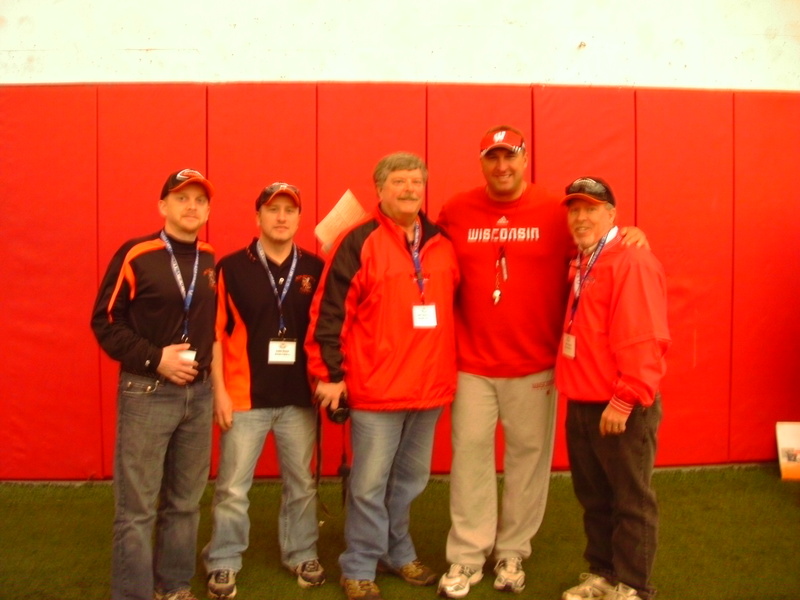 …I have even met the head coach Brett Bielema (however briefly and forgettable for him, I remember the moment). I just didn’t have the means. We have no television reception at home. Except for the want of a friend’s invitation, I would have watched the whole thing. Any friend’s invitation would have done the trick. Any friend at all! But here’s something important to note. That’s an important ownership issue I need to come to terms with. I didn’t call. I didn’t ask. I didn’t make the effort. I made other choices. I did—not my friends. For the record, let me enumerate what I did and didn’t do. 2) I didn’t pursue the options available to me. I had other options beyond a friend’s living room. I’ve gone to the local sports bar before. I could have Saturday night. I know the owner, play basketball with him during the week. He’d have gladly welcomed me to his establishment. 3) I chose to spend my time doing something else. In this case, I chose to watch a less-than-enjoyable video at home. I didn’t even watch something Ellen would have enjoyed. 4) I missed out. My choice led to an undesirable outcome—alone watching a poor movie as opposed to being with a friend swept up in the excitement of an instant classic. The direction you are currently traveling—relationally, financially, spiritually, and the list goes on and on—will determine where you end up in each of those respective arenas. This is true regardless of your goals, your dreams, your wishes, or your wants. The principle of the path trumps all those things. Your current direction will determine your destination. I wanted to see the Badgers-Spartans game. I could have. I lacked neither the desire nor the means. But my decision determined my direction and my direction determined my destination—alone in the back room watching a movie I’d rather forget. Question: What choice do you need to take responsibility for today? This entry was posted in Uncategorized and tagged Andy Stanley, Assertiveness, Big 10 Championship, Brett Bielema, Football, Michigan State, Responsibility, The Principle of the Path, Wisconsin. Bookmark the permalink. Staying the course. Accepting help where needed and just doing what I know, trusting God’s quiet voice instead of the yelling of doubt and distraction. How? Right now that means my primary job is raising up my three little one’s who are at home during the day. My secondary charge is to finish the 1st draft of my novel. Beyond that I have to ignore the people that discourage and the internal editor that says NO to life and possibility! Good choices to make. Would love to hear more about that 1st draft. What type of novel are you writing? P. S. Three little ones at home! I have enough trouble with one dog. My brothers and sisters (less than 6 years between oldest and youngest) count our mother an amazing hero (now that we’re old enough to know better).